I received these as a birthday present after dropping hints and I have to say they are worth evry penny. They look great on display and its a good chance to own an affordable piece of art. WHY HAS PRICE GONE UP TO 40 QUID? 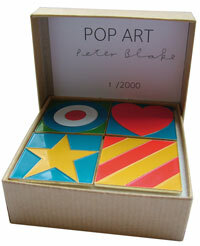 Hello, How do i purchase the Peter Blake Pop Art Enamel badges? phone number, email etc. Follow the link on the site – if they’re no longer there, you’ll have to presume they sold through.